With the latest round of Iron Builder underway, expect to see a flurry of LEGO creations featuring the Friends balloon piece, as we noted a few days ago with the lovely LEGO lotus blossom. Contestant Grant Davis is cranking out something new just about every day — and sometimes more than one new creation a day. 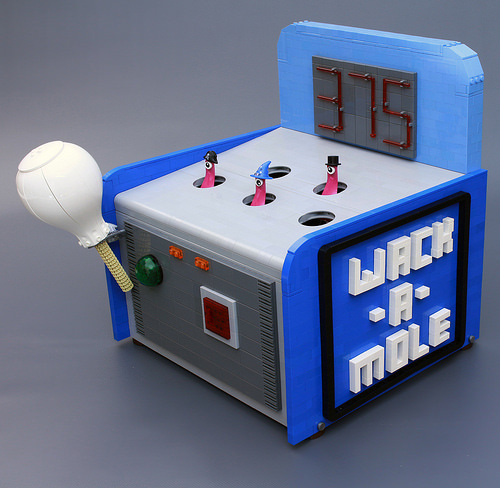 One of my favorites so far is this Whack-a-Mole machine. The ill-fated victims of whackage peeking with their single eyes out of their holes are also the tips of the bulbous balloon piece, and I just love their adorable little hats.